Traditions | Does This Font Make Me Look Fat? I grew up with a Norwegian mother (second generation in the US) and a German father (the Schippers had been here longer). Because immigrants back then were intent on assimilating, neither my mother nor my father grew up speaking Norwegian or German. A lost opportunity. I don’t recall any specific ethnic traditions in our household. But that didn’t mean I couldn’t create my own. 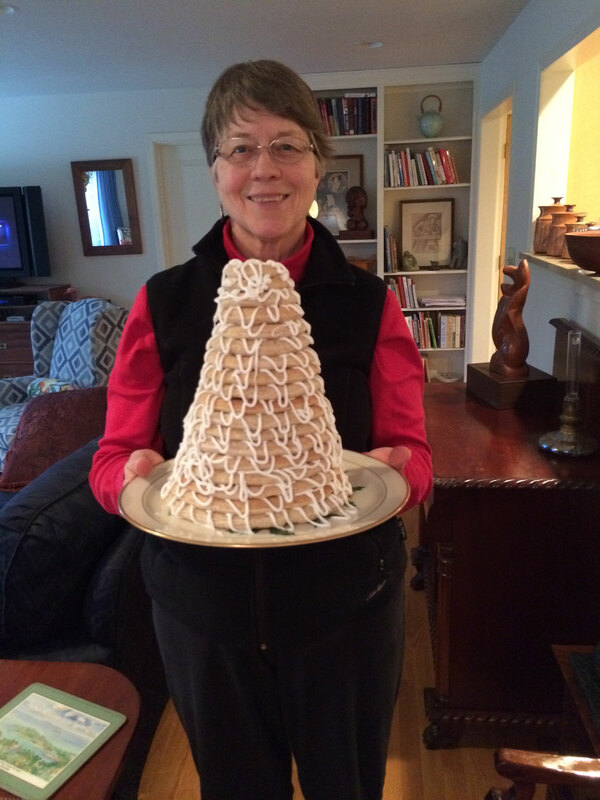 One Christmas season my brother, Ross, made a kransekake – a Norwegian wreath cake which consists of eighteen sequentially smaller rings stacked one upon the other. I was impressed so I got the recipe and tried it. Trying to figure out the sizes of those rings was interesting and I don’t have a photo of that first attempt. It was a very wonky tower, but the rings were quite tasty. 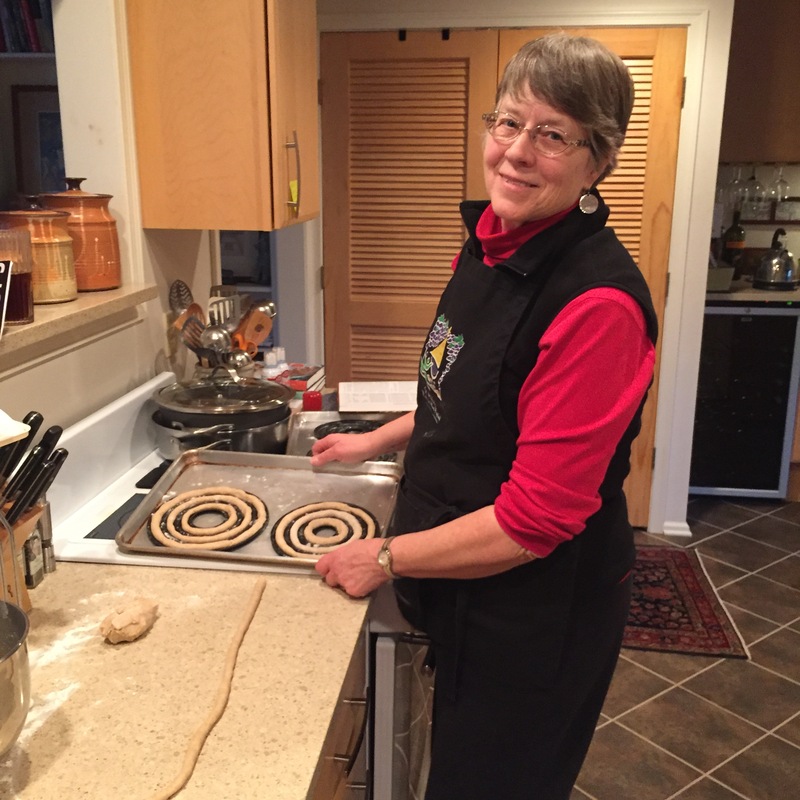 A few Christmases later my brother and his wife, Linda, gave me a set of kransekake pans. Now the rings would be exactly the right size. However the ground almond, confectioners sugar and egg white mixture that is the recipe needed tweaking. I was grinding my almonds in my food processor and the dough puffed up too much. 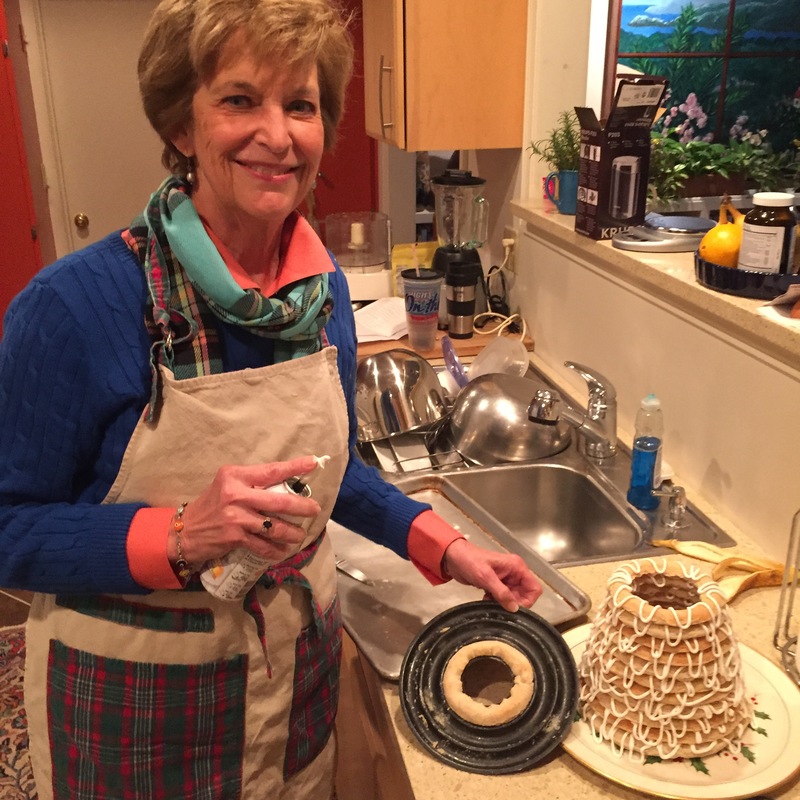 However, by that time I had involved my Montana granddaughters in baking a kransekake when we did a Montana Christmas. Those girls are all grown up now, but have requested baking a kransekake when we visit at Christmas this year. It’s become a tradition. Ross told me he ground his blanched almonds in a coffee grinder. I went on line to YouTube for more instructions, then ordered a coffee grinder on Amazon. I had it (free shipping) in two days. I love Amazon Prime. Yesterday I was ready. One of my yogi friends, Diane French, came to help. We discovered we needed to start the grinding process in the food processor to make the almonds into smaller pieces. Almonds are bigger than coffee beans! Duh. Then we decided to put the ground almonds through a sieve to make sure all the leftover almond bits were taken out and put through the grinder again. We made the dough and let it rest according to the recipe. 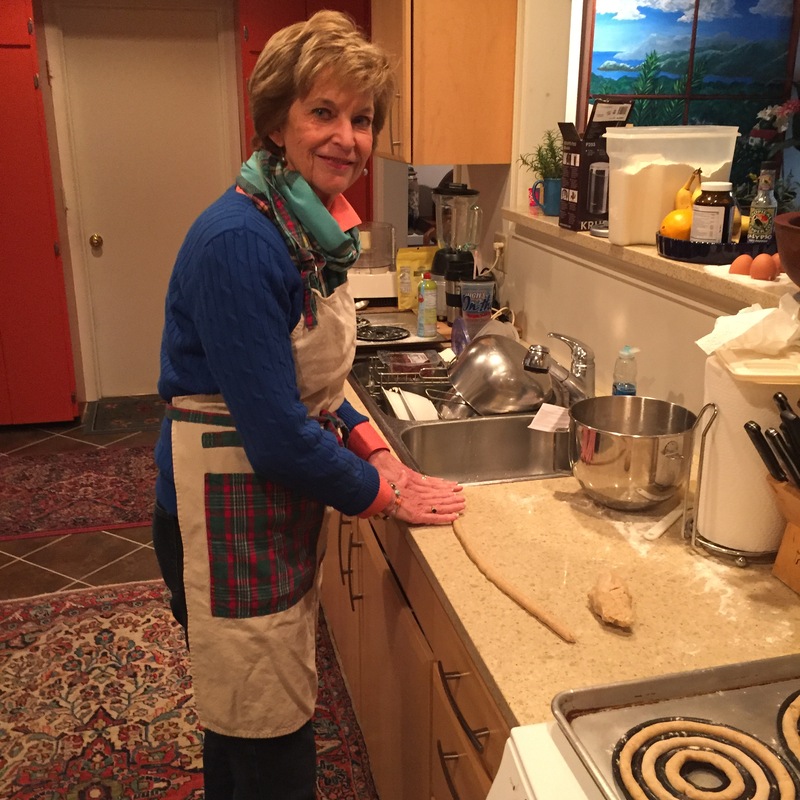 We rolled the dough into ropes the size of a pinkie finger and began filling the rings in the pans. The rings are baked at 396 degrees for 12 minutes. We learned that they needed to be cooled completely before we took them out of the non-stick pans. Next came the job of stacking the rings. They are quite close in size so there is probably a method, but we eyeballed it. White frosting is put on each ring and the next smaller size is laid on top. The frosting acts as a glue. We used white frosting in one of those spray cans. Here is the completed cake. It is a little wonky from one angle, but this is it’s best side. A turntable would have helped. I’ll get cans of red and green frosting and decorate the cake with holly. It will be even more festive when that is done. Traditionally it might have had Norwegian flags on it or Christmas crackers. This cake is also served at Norwegian weddings. I have to say that grinding the almonds in the coffee grinder made a difference. This is the best and prettiest kranskake I’ve made. However, those first couple done with the grand-girls are the ones I’ll really remember and the fact that there is now a Norwegian tradition in our family. For those who are wondering, the kake is served from the bottom ring up. Several bottom rings are removed and each ring is cut into pieces. In this way, the rest of the kake remains in the shape of a Christmas tree. This holiday treat is going to the Woman’s Club on St. Michaels on Wednesday. Laura Ambler and I are the program for the December meeting. We’ll be talking about how we turned our Christmas memory book, The Santa Diaries, into a produced Christmas play of the same name. ‘Tis the season of memories and making traditions.